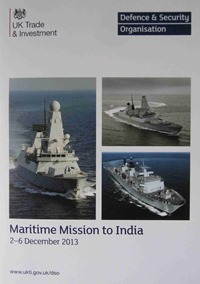 UK Trade & Investment – Defence & Security Organisation (UKTI DSO) is presently on a Maritime Mission to India from 02 to 06 December, 2013. An interaction with this Maritime Mission was organised by National Maritime Foundation (NMF) – Chennai Chapter at Seafarers Club on 04 December 2013 in the presence of Mr Bharat Joshi, British Deputy High Commissioner – Chennai. The session started by highlighting the rich maritime heritage of India with UK and other European Countries. Welcome Address by Commodore (Retd) S Shekhar, Regional Director, NMF, Chennai Chapter. Special Address by Dr T S Sridhar IAS, Additional Chief Secretary/Commissioner, Revenue Administration, Disaster Management and Mitigation, Government of Tamil Nadu. Maritime Mission Address by Head of Delegation – Mr Tony Graham, Director Ships, Defence Equipment & Support, UK Ministry of Defence. Closing Address by Commander Mark Fitzsimmons, Royal Navy, Naval Advisor, UKTI DSO. Atlas Electronic – Centre of excellence for maritime and port security; delivers world leading systems for protection both above and below the water line. BAE Systems – Global defence, aerospace and security company employing around 88,200 people worldwide; wide-ranging products and services cover air, land and naval forces, as well as advanced electronics, security, information technology, and support services. Chess Dynamics – Principal defence and aerospace supplier to UK and overseas customers; has engineering expertise to develop new and innovative military products for land, sea and air applications; offers a range of naval and maritime gun fire control and surveillance systems under the family name of Sea Eagle; also offer a range of electro optical surveillance systems for applications in border, coastal and infrastructure protection under the family name of Hawkeye. CTruk – Relatively new and ambitious company; has rapidly established itself as the market leader for the provision of twin hulled, composite vessels for the offshore wind sector. Kelvin Hughes - Surveillance division is a global radar system solution provider meeting the surveillance, safety, and security needs of the world’s navies, coastal and border operators, and security patrols; provides surveillance and navigation systems to 30 of the world’s navies; Kelvin Hughes Surveillance radar is the primary tool for developing a situational awareness capability for mission delivery at sea, onshore or on land. MBDA – Leading global player in its field of Missiles; world leader in missiles and missile systems; the first truly integrated defence company in Europe and the only Company able to provide guided weapon systems for each branch of the Armed Forces, whether in the air, at sea or on land. Selex Electronic Systems – International leader in electronic and information solutions for defence, aerospace, space, security, high-integrity surveillance, network management, information security and mission-essential services; entrusted by its customers and partners, the company delivers solutions across the lifecycle for a safer, smarter and more secure society. Strongfield Technologies – Specialist supplier of High-tech components and equipment for Defence and Space applications with 40 years of experience; provides Engineering, Design and Consultancy support for Defence and Aerospace programmes. TATA Steel – European operations of Tata Steel; has main steelmaking sites in the UK and the Netherlands; Europe’s second largest steel producer; supplies steel and related services to construction, automotive, packaging, rail, lifting & excavating, energy & power, shipbuilding, aerospace and other demanding markets worldwide. Thales UK – Has more than fifty years experience in delivering equipment, systems and services to naval forces; offers unrivalled and proven expertise with tangible benefits for client navies around the world; supports naval missions across the seven seas, Anti-Air Warfare, Surface Warfare, Underwater Warfare and Maritime Safety & Security, trusted & deployed by over 50 Navies. Address by Commodore (Retd) S Shekhar, Regional Director, NMF, Chennai Chapter. Address by Dr T S Sridhar IAS, Additional Chief Secretary/Commissioner, Revenue Administration, Disaster Management and Mitigation, Government of Tamil Nadu. It may be recalled that U.S. Ports and Maritime Technology Trade Mission visited Chennai on 21 February 2012. Thanks to Commodore (Retd) S Shekhar, Regional Director, NMF, Chennai Chapter for organising this wonderful interaction with UKTI DSO Maritime Mission. 2 years back also DOC, ITA and CS organized Maritime Technology trade mission to India which included one-on-one business appointments, and the purpose was to introduce U.S firms to India’s rapidly expanding port and marittime techonology market and to assist U.S. companies.